It’s hard to decide which of Patrick Robertson’s new toys — ah, I mean, remarkable scientific research tools — is the coolest: the boot with the GNSS and inertial sensors inside it that the DLR researcher is using to develop self-locating self-aware (SLAM) indoor mapping techniques, or the quadrotor intended for the same purpose, only airborne. My colleague Richard Fischer had a definite preference for the quadrotor, named Wilbur after the flying American Wright brother (see photo with Patrick and Wilbur). 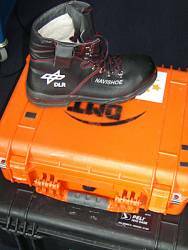 But how can one resist the Navishoe (or, given its stout profile, perhaps Naviboot), DLR’s take-off on Intersense’s trademarked NavShoe, which houses inertial sensors from the U.S. company and others along with DLR’s SLAM mapping database? DLR — the Deutsches Zentrum für Luft- und Raumfahrt or, more simply, German Aerospace Center — is a hotbed of GNSS and related research activities as well as home of the Galileo Operations Center, about both of which we’ll see more in Inside GNSS soon. Inside GNSS editor Glen Gibbons is blogging from Munich, Germany.